Late last year I bought myself a Christmas present—six months membership in Rebecca Anderson’s Curiosity Club. Rebecca, one of my favourite and inspirational jewellery artists, has a little bead supply shop on Etsy, selling Czech beads, waxed linen cord, her own range of handmade findings and most recently a nice little selection of Vintaj components and leather cord. Last year she set up the Curiosity Club, a monthly shipment of beads and components personally selected by her. 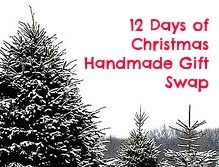 Along with the shipment, there is a Facebook page for members to share their designs, and each month Rebecca does a little tour on her shop’s Facebook page to show off what we all make from the kits. So far I have received two kits, and the third should arrive any day now. Silly me, I haven’t taken a picture of each kit before diving in, but they’ve been lovely, with some waxed linen, a selection of beads sweetly threaded with a little brass or silver key and a special component or two! Anyway, I thought I would show you some of the things I’ve made so far using the beads and findings I’ve received. The first kit, sent in December was called Winter’s Tale (Rebecca is from the UK, currently living in Belfast, Ireland), The special item in this kit was a pair of snowflake charms from Bohulley Beads, which I used in a pair of earrings along with the charcoal grey waxed linen and some of the clear and smoky rondelles, Rather than just stringing the beads on the linen, I did a little macramé between each bead. 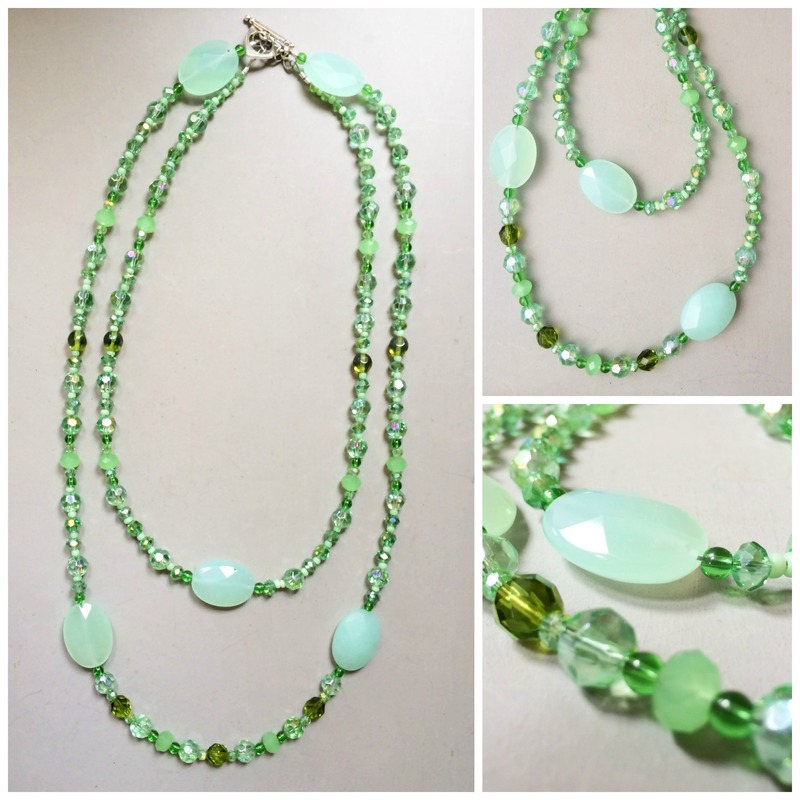 Sadly, the school holidays prevented me from making more from this kit, although I am still mulling over the remaining beads, which include a variety of minty green and olive beads. Before I knew it, it was time for the January kit to arrive. Aptly named Paintbox, this kit contained a bright and happy selection of beads in aqua blue, lavender, and bright fuschia pink, some pale green leaves, a red heart, Picasso-finished flowers, waxed linen in lavender and denim blue, and some of Rebecca’s own components—a spiral clasp and a pair of heart headpins. 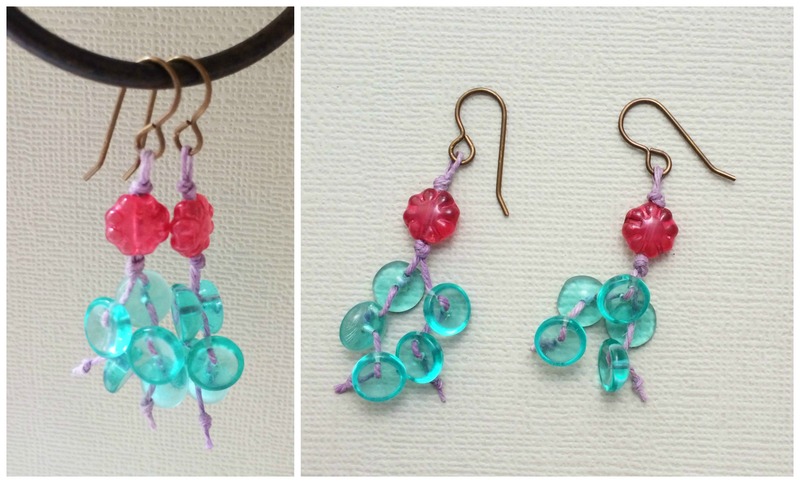 The first beads I turned to were the aqua blue piggies—little curved beads with two holes. I wove the lavender waxed linen in and out of the beads and dangled them from the fuschia flowers. 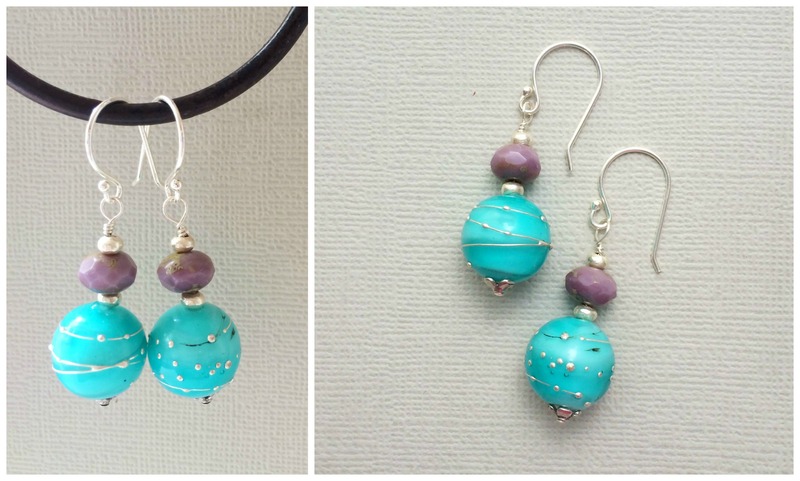 The lavender and aqua combination looked great so I dug out some fantastic aqua blue lampwork beads from Brisbane-based lampworker Liz de Luca to make some more earrings, this time with the lavender rondelles and some tiny Hill Tribe silver bead caps and spacers. So far, obviously, it’s all been about the earrings. I’m working on a challenge at the moment—the 3rd Annual Challenge of Music—which may well find itself using a few more of the beads from the kits in a bigger piece. 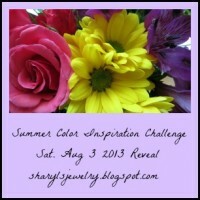 The reveal date is this Saturday so come visit me then to see what I have come up with. 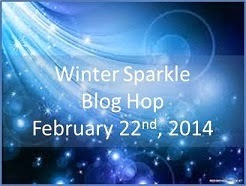 I’m taking part in today’s Winter Sparkle challenge and blog hop hosted by Lisa Lodge of Pine Ridge Treasures, despite the fact that it is still (for another week) summer here in Australia. Although this week we have had our first taste of autumn, with cool damp weather (hopefully tomorrow will be warmer). My kit this time contained a variety of green beads, ranging from large faceted ovals, to tiny sparkly crystal rondelles and seed beads. I decided to make a 2-strand necklace, using as many beads as I could. The only beads I didn’t use from the kit were the bugle beads. And I have to apologize for the fact that although this necklace is “finished” it’s not finished to my satisfaction—at some point I will probably redo it, as I am not quite happy with it (there are a few mistakes and I haven’t got any crimp covers, it bothers me LOL). Lisa also included a couple of sparkly clear faceted drops, which will become earrings one of these days. Thank you again for a wonderful kit, Lisa. Please take some time to see what everyone else made! Earring-focused blog Earrings Everyday has added a monthly design challenge for its readers—the We’re All Ears challenge—which of course means making earrings. 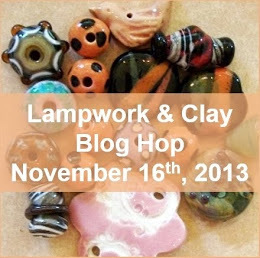 As luck would have it, around the time this picture appeared in my feed, I received some gloriously green lampwork beads from Beads and Botanicals that immediately announced their intention to take part in this challenge. 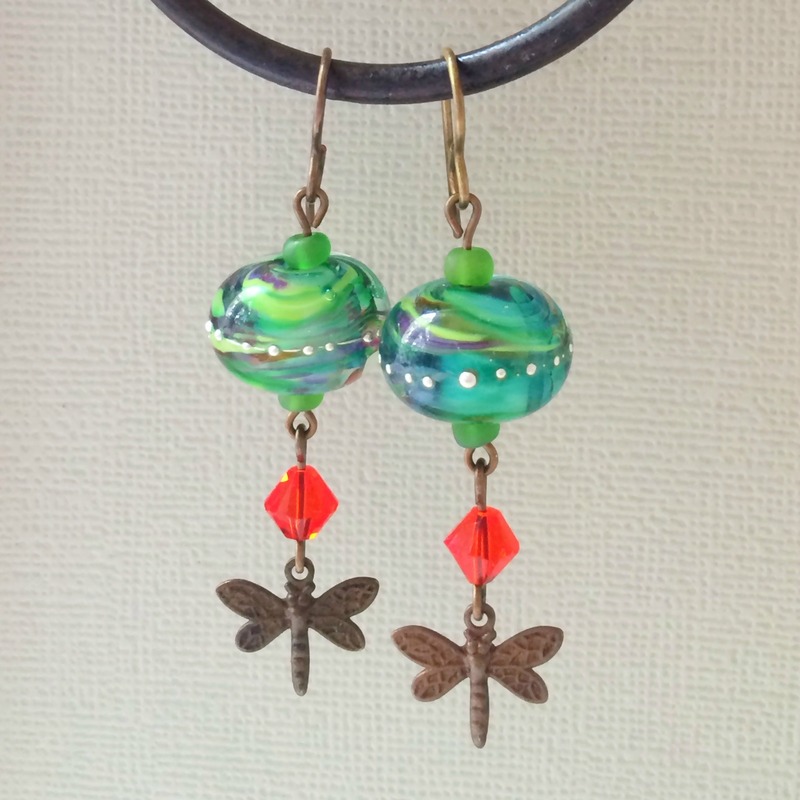 To keep it simple and let the beads talk, I paired them with tiny Vintaj brass dragonflies (the closest I could get to damselflies) and an orange Swarovski crystal. I’m very tempted to keep this pair! 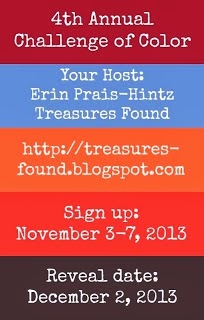 And I’m looking forward to seeing next month’s inspiration! 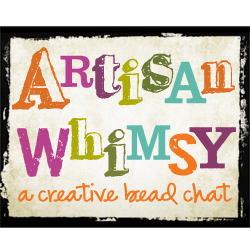 If you’re interested in seeing the other designers taking part in the earring challenge, go to today’s post on Earrings Everyday for the link-list (sadly it doesn’t work properly on WordPress.com blogs, so I can’t add it here). 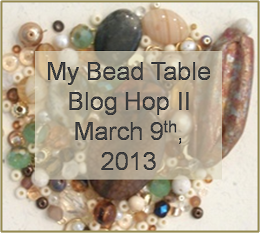 I’ve talked about Bead Swap USA, the bead swapping group I belong to, in the past. It’s a great group and I have met some wonderful people through it. 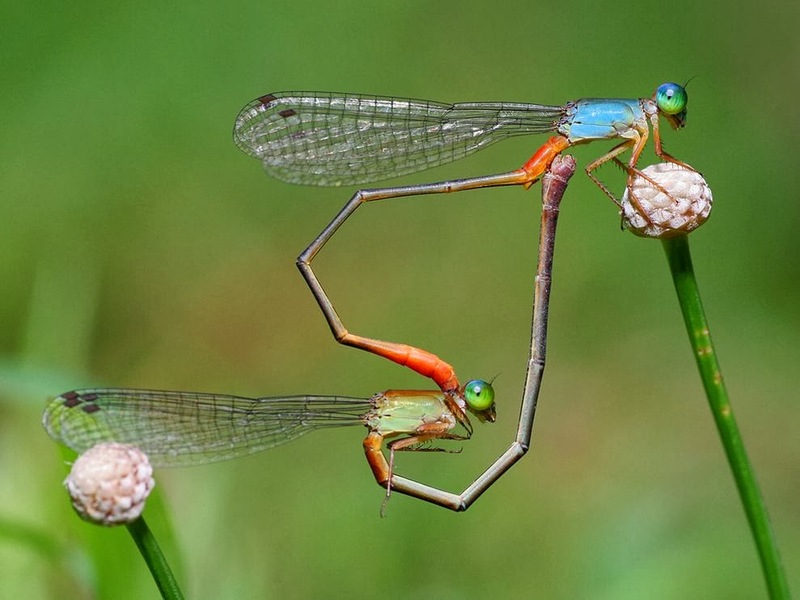 Recently we had a swap for Valentine’s Day of handmade (by us) pendants and charms. My swap partner was Lennis Carrier, from Windbent, who has become a good friend, although we have never met in real life! Lennis is, hmm, not a pink hearts and flowers kind of girl, so I knew I would have to be creative here, and I spent a lot of time searching Etsy and Pinterest for different ideas. I knew I had hit the jackpot when I came across the Etsy store Chocolate Rabbit, who has a fabulous selection of downloadable images with spells and potions. I decided to make Lennis a spell book using the images. To make the covers I hammered out some copper sheet to make covers, antiqued them with Liver of Sulfur and then glued the book front and back images onto them. 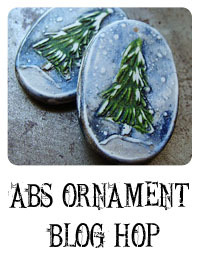 I then sealed them with several layers of matte finish Mod Podge. I wanted to give them a crackle finish, but couldn’t lay my hands the right kind of crackle medium, but the Mod Podge did add to the old look. I also rubbed Renaissance Wax onto the bare metal so it was protected from further tarnish. I used jumprings to put the book together. It’s a big pendant, about 3 inches by 2 inches! 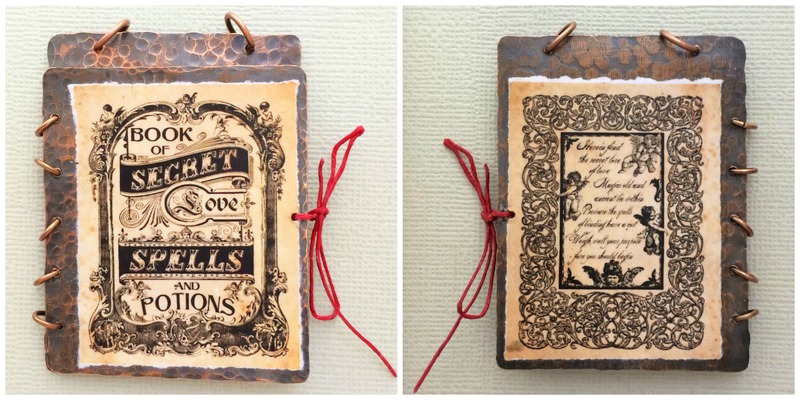 Inside the book I used kraft paper to make pages, and glued tiny love spells to the pages. 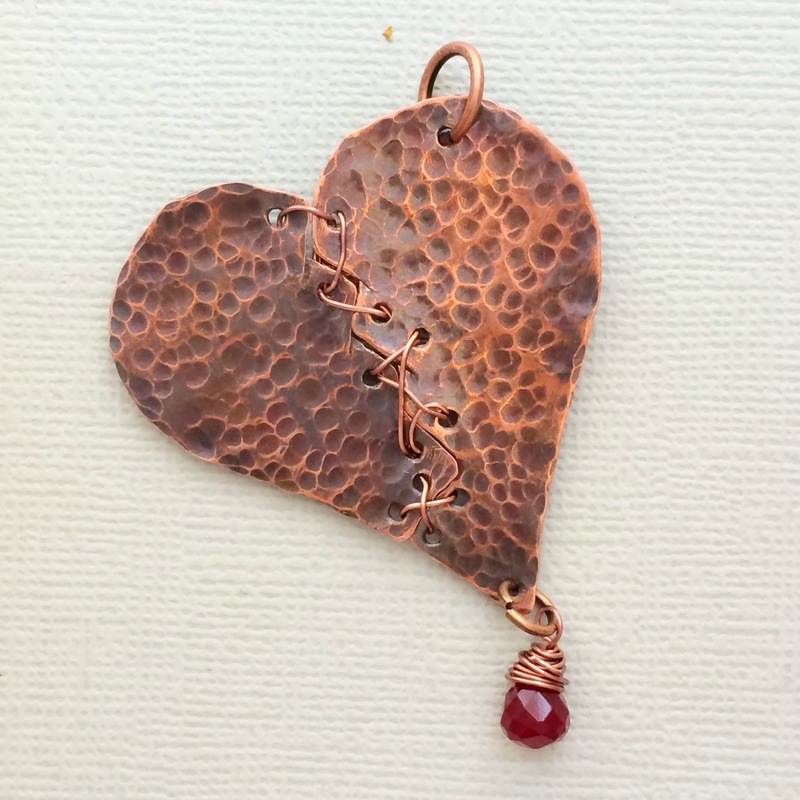 While I had the copper sheet out, I also cut a heart from it, hammered it to give it some texture, then cut it in half and stitched it up again using copper wire. Again, it was antiqued with LoS. A tiny blood red glass briolette hangs from the bottom, hence the name: Torn and Bleeding Heart. 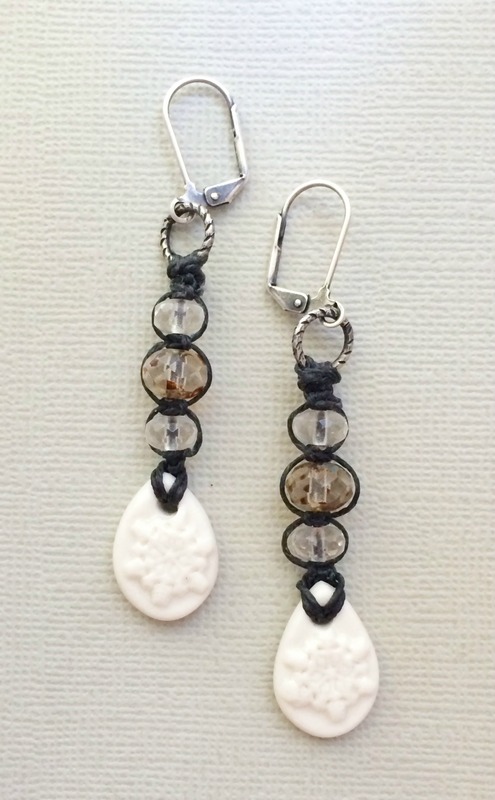 My final set of hearts for Lennis used some textured porcelain charms I made in Mum’s studio about a year ago. These had been fired but not glazed. I rubbed Gilder’s Paste in a patina blue-green shade onto the front, back and sides, wiping it back a bit so the white showed through here and there. I went over the top with some more Gilder’s Paste in a bronzey colour and then after they’d dried I sealed them with a matt spray sealer. 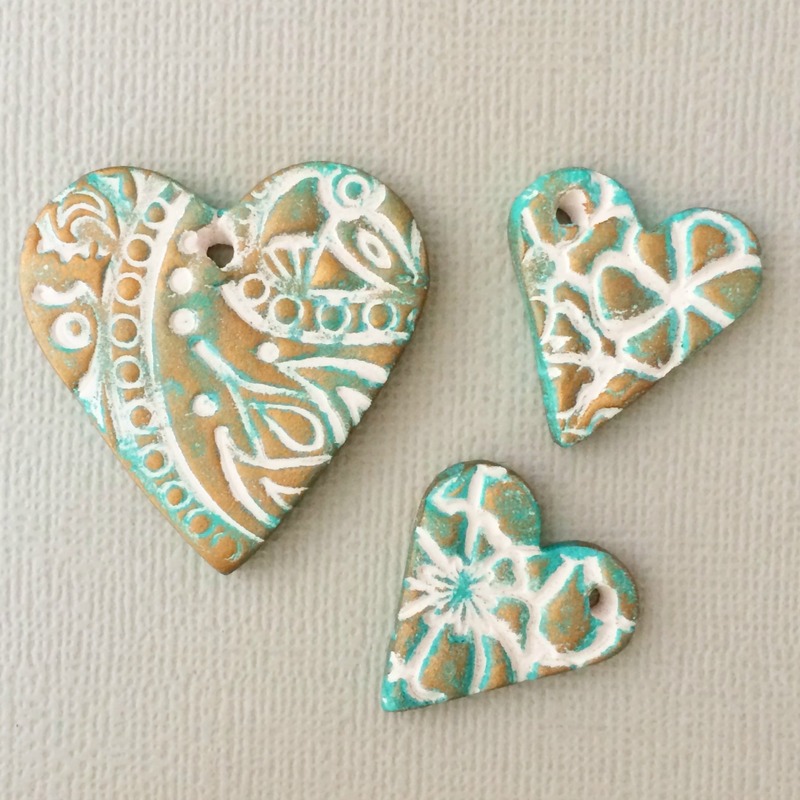 I have a whole pile of unglazed porcelain charms and pendants to play with, and I want to try a few different things with them, including using the Swellegant system of metal paints and patinas. I’ll do another post when I have some results! 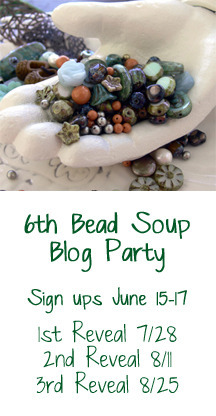 I just signed up for the 8th Bead Soup Blog Party, the third I will participate in! I’ve got a very soft spot for this blog hop, it was the one that got me blogging in the first place (although not the first blog hop I did), and it’s certainly the biggest and best known of the jewellery design blog hops. And Lori Anderson, the founder and the organizer of the hop (believe me when I say it’s a massive effort on her part, I suspect that for the next 2-3 weeks, she and her family will eat, sleep and breathe the partnering process, and that’s a big job even when you haven’t been ill for the best part of the last 12 months), is one of the sweetest people I’ve ever met, in real life or otherwise (hoping one day it will be in real life). Anyway, by the end of the month I should be paired up and I can finalise the bead soup, tailored to my lucky victim partner. It’s got to have a bit of Australia in it, so I’m thinking about the various bead artists I know and like down here. 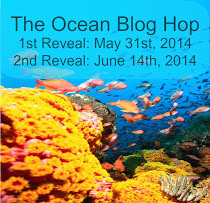 The big reveal isn’t until 3rd May, which sounds like a long way away, but really isn’t so far! Expect another post or two from me along the way. Click through if you want to see what I made in 2012 and 2013. In the meantime, I have a few things to keep me busy. 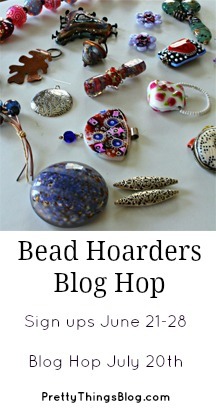 One of my favourite blogs, Earrings Everyday, is starting a monthly earring challenge, which is due on the 21st Feb, and I am doing Lisa Lodge‘s Winter Sparkle blog hop on the 22nd. I’ve got a good idea percolating for this month’s Art Bead Scene Monthly Challenge, which has a beautiful Paul Klee painting as its inspiration. 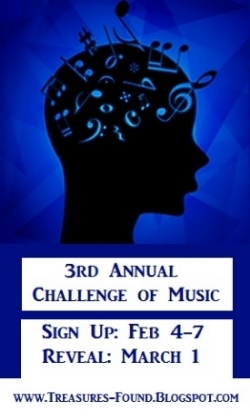 And the 3rd Annual Challenge of Music, from the endlessly inventive Erin Prais-Hintz, is on 1st of March. 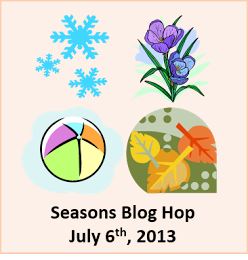 I try to keep all of the upcoming blog hops listed via linked blog buttons at the top of the right hand column of this blog, while completed hops are moved down to the bottom of the column. 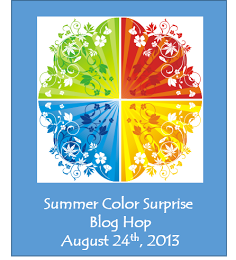 One day I might even manage to make a page for blog hop links, does that sound useful?? I’ve also signed up to do a couple of markets in March, a school fair and a new market that hopefully will be in the right place at the right time to get some sales. More details on both of those when I have them. 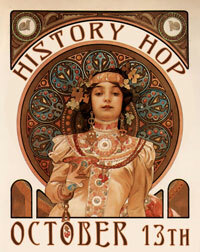 My regular market—The Handmade Show—doesn’t start until April, and my first show there will be in May as I’ll be away in April. I’ll be back on the weekend with some recent designs and a new jam recipe variation!